Most dynamical models of Hurricane Matthew shows a track near the east coast of Florida and the southeast of the United States starting on Thursday. Tropical storm or hurricane conditions could affect portions of Florida, Georgia, South Carolina, and North Carolina later this week or this weekend, even if the center of Matthew remains offshore. We will continue to monitor this tropical system and send updated DOC Alerts as the forecast develops. In the meantime, if you are in need of our services please call the MediGroup Emergency SRM Hotline: 888.243.5760. Matthew made landfall over the western Tiburon Peninsula of Haiti around 7 a.m. ET this morning. Matthew is still a Category 4 storm and will continue to move north today and approach the eastern tip of Cuba this evening. Catastrophic damage from wind, rain and landslides will occur across far western Haiti today and far eastern Cuba tonight. Many structures will sustain heavy damage if they are not completely destroyed. It will take months to repair infrastructure. Tropical storm-force winds with gusts to 60 mph will impact eastern Jamaica into this afternoon. This can lead to power outages and some damage to structures. Conditions across eastern Cuba will deteriorate today as Matthew gets closer to the eastern portion of the island. The center of Matthew will reach far-eastern Cuba this evening or tonight, although it's possible that the center misses Cuba just to the east. Regardless, for far eastern Cuba, widespread power outages, major damage to most, if not all structures, and complete destruction of weaker structures are expected. A storm surge of at least 10-15 feet, possibly higher, will impact the south-facing shore of far-eastern Cuba as Matthew approaches, then makes landfall. Matthew will approach the southern Bahamas early Wednesday, when it will still be a major Category 3 hurricane. Matthew is expected to turn toward the northwest and move into the central Bahamas on Wednesday night or Thursday morning. At that time, Matthew should still be a major Category 3 hurricane. The combination of hurricane-force winds, flooding rain and a storm surge of 8-15 feet will cause major damage across the southern and central Bahamas. Matthew will then impact the northern Bahamas on Thursday and Thursday night. Rainfall amounts of 12-24 inches, perhaps more, are expected across parts of Haiti and eastern Cuba. This will cause catastrophic flooding and mudslides across those areas. Heavy rain of 8 inches or more can bring flooding and mudslides to parts of eastern Jamaica. Over a foot of rain is expected across parts of the Bahamas from Matthew. The track of Matthew has shifted slightly to the west on Thursday through the weekend, closer to the Southeast coast. With this track, Matthew would approach eastern Florida later on Thursday through Friday and the Carolina coast on Saturday. With this track, outer rainbands and gusty winds will impact these areas through Saturday. High waves will batter the southeastern U.S. coast later this week and into the weekend as well. The wind field from Matthew will grow larger later this week and it will get close enough to the southeastern U.S. coast to bring tropical storm-force gusts past 50 mph to the Atlantic coast of Florida as early as Thursday night and coastal areas of the Carolinas as early as Friday night. A landfall along the Carolinas cannot be ruled out at this time. 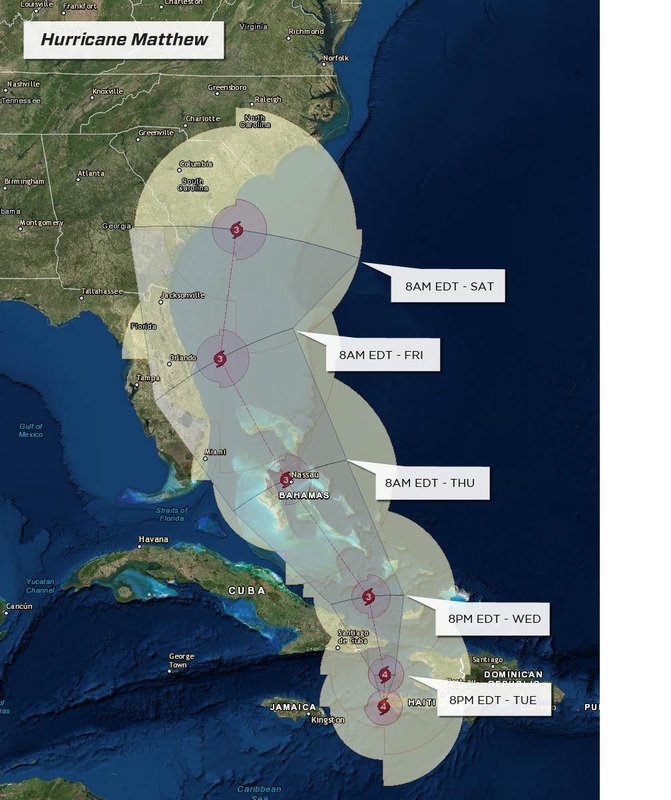 Hurricane-force winds could impact the coasts of the Carolinas Friday night through Saturday night. Hurricane Matthew is currently a major hurricane and is slowly moving north across the Caribbean. By Thursday, Matthew is expected to continue a northward track and just miss the Florida coastline to the east and then begin to make a northeasterly turn just east of Georgia and the Carolinas. There exists some uncertainly with the exact track of Matthew, however, heavy rain will impact coastal Florida and Georgia into the eastern Carolinas regardless if Matthew makes landfall or not. 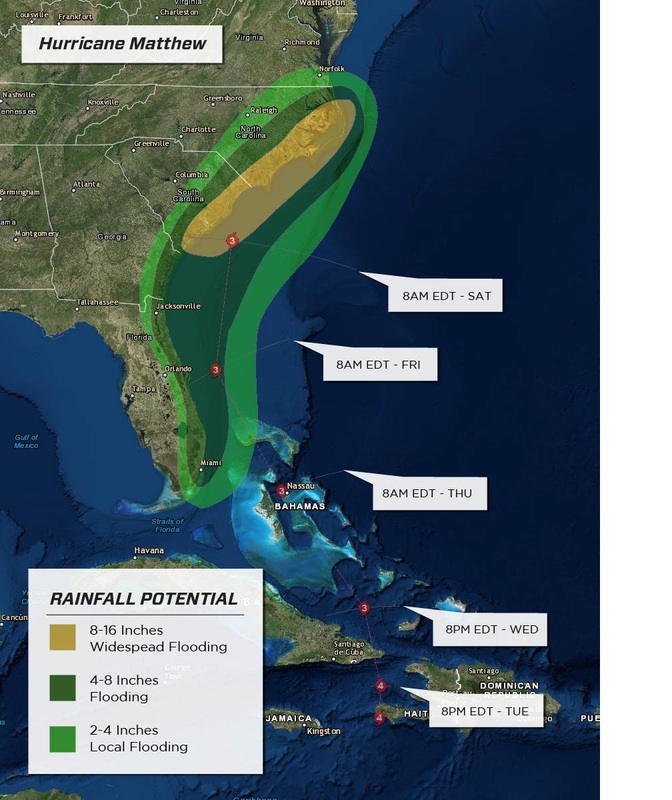 Heavy rain will first develop Thursday across the Florida coastline and then spread into southeastern Georgia Friday as Matthew makes its northeastward turn. By Friday night into Saturday morning, heavy rain will begin over eastern portions of the Carolinas and continue through much of Saturday. Widespread flooding will quickly develop over coastal South Carolina and North Carolina especially on Saturday when Matthew makes its closest pass near the Outer Banks. Major disruptions to logistical operations such as road closures, railroad washouts, and power outages are likely. In addition, damages to businesses and homes are expected.